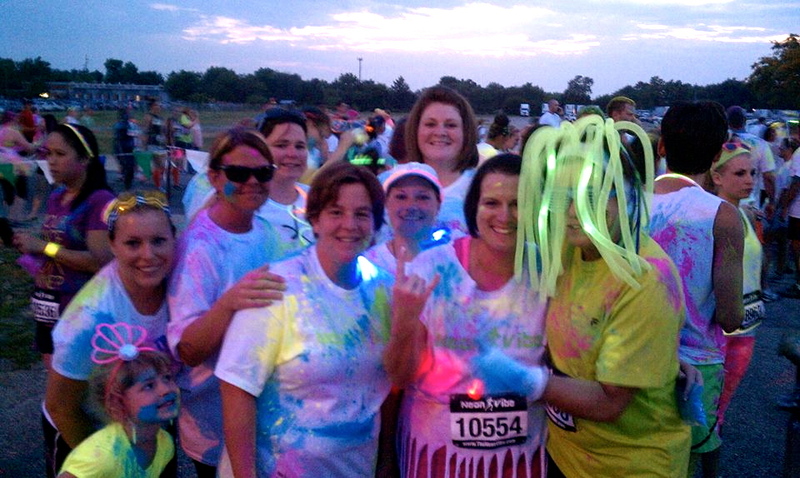 Our crew before the run! Saturday I spent most of my day stretching, foam rolling, and putting my trigger point kit to good us. All because I really, really, really, wanted to go to the Neon Vibe 5k. It all helped and thanks to some wonderful friends who offered to walk it with me, I was able to go and enjoy a very fun event. Neon Vibe is like a color run but it's at night and the colored powdered everyone gets to throw one themselves or each other glows under black light. 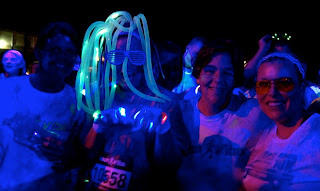 People dressed up in fun outfits, wore glow-sticks all over, and some even had light up accessories. Like my friend, Becky, in the picture below. Full marathon, Chicago! She had an 18 mile training run earlier in the day and still came out to walk with me. The race at night so the trail was marked with lighted cones and then the color areas where race volunteers douse the runners with more powder were lit up with black lights. It was fun. 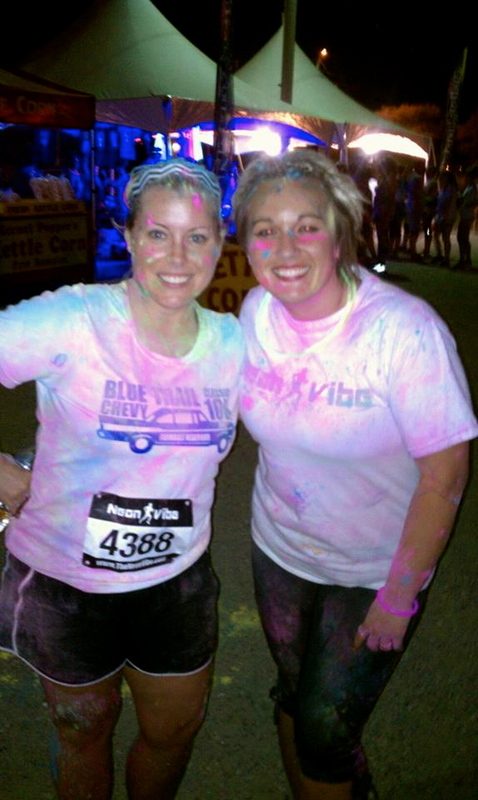 I recommend you wear clear or yellow lensed glasses though to avoid getting powder thrown in your eyes. 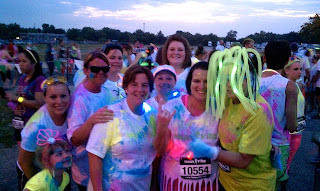 After the run, there was a DJ and a very hopping dance floor all lit up with black light! Neon beach balls were being tossed around by the crowd, neon liquid was randomly sprayed into the crowd of dancers, and even neon hula hoops were present. It was fun just to watch let alone join in. My friend, Christina and I. We were separated before the race started and didn't meet back up until it was over. Definitely a great time had by all and I hope to go again next year!